You get these from new JC-dailys and are used to buy Jewel Crafting recipes that will cost 5 tokens each. 174 tokens required to purchase all the available patterns. It will be interesting to see how many consecutive days of completing the daily quest will be required to obtain all the patterns. i am curious why does it unique tag Unique (2147483647) is that the max amount of them that you can carry? wow i am a programmer and dont know that anyway jagno posted below that is the maximun value of a signed integer but again why does it show up in the item. As of information available so far, it's unkown whether a random daily (like the current fishing/cooking ones) will be available, or if you can do all of them each day. Currently on the beta server the quest is bugged - the mobs don't drop the necessary quest items. At the moment, normal blue qual gem designs cost 5 tokens and metagem ones 8 tokens. You can also purchase a unique BoP dragonseye for 1 token which is used to make the epic JC only gems. It is unknown yet whether green quality or epic quality gem designs will get added to the list. Or whether there'll still be world drop equivalents of the blue designs like in live version right now. 236 for all recipes and 3 dragons eye, a total of 40 days of completing 6 dailies a day. Keep in mind that if you have one toon you are concerned about, you may not need to (for instance, on your holy pally) need to make tanking or ret gems. You'll probably prioritize what you need seeing as the market is very small as far as sale goes, although, fellow JCs will be able to craft a gem you cannot cut yet if need be. I'm pretty sure the point is that it will not be a conceivable feat to acquire all the recipes available, nor would it really be worth the time unless the quest is as simple as "talk to him over there for a token lawl." Edit: I was wrong, the gems bind when cut, only the raw gems can be traded. Thus, unless you are a hybrid that does EVERYTHING at some point (such as a druid that at some point is a tank, feral dps, balance, and resto), it will never be worth investing the time to get ALL of these. Seriously if you don't know what signed/unsigned integer/float/long/double/longlong/longdouble/char/bool/etc is... Then you're not a &*! @ing programmer. Knowing HTML does not qualify you as a programmer. You aren't a programmer if you don't know what signed/unsigned integers are. Knowing Hello World in HTML doesn't qualify you as a programmer. My guild is setting what JC gets what kinda of pattern first to help raiding. I've done the JC daily's for four days in a row now, and each time I've gotten the item from the first kill. I would disregard the drop ratings listed. Since most of the time people killing the needed mobs don't have the quest. These are like like badges for the daily JC quest given by Timothy Jones. Here are the quest he gives. This is the first quest and it opens up the dailys. Vrykul Amulet drops in Howling Fjord from humanoids. Horde see tip C, go South and kill Winterskorn located in Skorn. Alliance see tip F, go South West and kill Winterskorn located in Skorn. Elemental Armor Scrap Drops in Dragonblight from Ice Revenant. Horde & Alliance see tip B, go East and kill Ice Revenant. Horde see tip C, go South East and kill Shoveltusk Forager. Alliance see tip F, go West and kill Shoveltusk Forager. Proto Dragon Bone drops off any proto dragon. Horde see tip C, go South West to Ember Clutch & kill Dragonkin. Alliance see tip E, go South East to Ember Clutch & kill Dragonkin. Scourge Curio drops from any scourge mob. Horde see tip D, go North East and kill Scourge Siegesmith. Alliance see tip G, go East and kill Scourge Siegesmith. Iron Dwarf Brooch drops off Iron Dwarfs in Grizzly Hills and Howling Fjord. B. <H>Nethestrasz <Flight Master> in Dragonblight. C. <H>Celea Frozenmane <Wind Rider Master> in Howling Fjord. D. <H>Junter Weiss <Bat Handler> in Dragonblight. E. <A>Greer Orehammer <Gryphon Master> in Howling Fjord. F. <A>James Ormsby <Gryphon Master> in Howling Fjord. G. <A>Rodney Wells <Gryphon Master> in Dragonblight. I did a couple of these dailys already and the level 77 required noted by wowhead is not correct. There is no physical inventory item which is created for you to collect. It confused the hell out of me - someone who left the game around patch 2.3 - until just now, as there were no items in my inventory to indicate that I had received anything from completion of the quests. only one token per day can be given ? Why do only Jewelcrafting and Cooking get the daily quests and tokens? Not only does jewelcrafting get their own token reward system, but they get two! They can buy recipes with Dalaran Jewelcrafting Tokens and with Stone Keeper's Shards. Do you have to be jewelcrafter to do the dailies? Yes, you must be a JCer to do these dailies. The item you combine with the two gems is a quest item drop and cannot be traded, thus you cannot hand it to a JCer to make the item you need to turn in. You can start getting these at 375 Jewelcrafting skill. There is also another JC daily in Valgarde in Howling Fjord who gives you a token and a a bag with a cut gem in it. So I am assuming you can do 2 dailies a day. I know I did 2 today and have been doing Timothy in Dalarans quest for weeks and had completed that one before doing JC quest in Valgarde. Dudes name is Ounhulo and is the JC trainer out there. Insane...a Jewelcrafter can make 400g a day doing one daily quest. 400g is how much the Dragon's Eye goes for in the AH. And is why high-level JC items cost 2000g+. I thought I'd just point out that most Jewelcrafters will NOT be buying ALL the recipes purchasable with these tokens. Does a Warrior need +27 Spirit? No. Does a Rogue need +27 Intellect? No. Sure you'll probably be buying all the recipes for gems you can cut and sell, but you don't need to buy all the recipes Tiffany sells. Don't like PvP? Don't buy the PvP ring recipe. Simple as that. Remember also that it is very unlikely that you would even want all the recipes. A mage, for example, is not going to want the BoA strength gem. This is one of the dumber things Blizzard added to the game. They made the progression stupid easy, rep grinds easy, gear collection easy. Then they add tedium to a select few skills, just to kill them off. I'd rather cut my heart out with a spoon than repeat these quests 80+ times to get most of the good recipes that would be of value to my guild. What level of JC do you need to start doing dailies? I'm about to drop mining for JC and I want to know what minimal level I need to make epic gems for myself. I know the recipe requires 370, but can I get the tokens this early? Oh, a mage would? Probably the best Gem you can sell to warriors, retadins and DKs beside the new Stamina/Strength Gem, isn't it? If I were to drop Jewelcrafting for any reason, do my accrued Jewelcrafter's Tokens go away? I don't mean the recipes I've bought and learned; I know I lose those. But if I were to still do dailies, collect tokens, drop Jewelcrafting, eventually relearn it, and regrind the skill, do I still have all of those tokens I had earned before for rebuying recipes? If I lose them upon skill unlearning, should I just buy recipes prior and not learn them? You are, of course, assuming I'm not obsessive-compulsive and don't have a sick NEED to get every JC recipe in the game. does anyone know if you have tokens and you drop jewelcrafting do you still keep the tokens? Oh, and here is something JC's might find useful for Patch 3.2. -Cardinal Ruby (red), King's Amber (yellow) and Majestic Zircon (blue) can be bought for 20 Emblems of Heroism each. -Ametrine (orange), Dreadstone (purple) and Eye of Zul (green) can be bought for 10 Emblems of Heroism each. -The epic gems can also be bought from Captain O'Neal (Alliance) and Lady Palanseer (Horde) for 10000 Honor Points. -The Recipes to cut epic gems cost 5 Jewelcrafter's tokens. Jewelcrafters will be able to trade in 10 Titanium Powder (which is approximately a 60% drop rate from prospecting Titanium Ore) for 1 Dalaran Jewelcrafter's Token in 3.2. Anybody figure out how many tokens it would take for a brand new JC to get every recipe up to and including the new stuff once 3.2 hits? Based on my last estimate you'd need a bit over 500 tokens, and assuming you aren't blowing everything you make on broken necklaces (which on my server are about 250g each even before 3.2) would take you over 500 days. Heck, let's assume I had about an hour to farm ore, and that I could put together a full stack of Titanium Ore in that hour (which is a bit ridiculous on a pvp server, unless you are farming at 3am). 3.2 notes say you have about 60% chance of getting powder from prospecting titanium, assuming you get 1 powder each time that gives you about 2.4 for each stack. So one stack of Titanium a day and very roughly you are looking about 9.6 every four days, I'll round it up so that I'm guestimating about every 4th day I get another token on my own from turning 10 titanium powder into a token, without being raked over the coals on the AH by buying Titanium. I'm still looking at about 400 days of JC dailies and 400 hours of farming ore, assuming the best of conditions. Someone please tell me that I'm missing some big loophole? The only reprieve I can imagine is selling every epic gem I get from prospecting, to buy more titanium, prospect and repeat, but given the numbers of JCs on my server, I expect our demand for tokens to far outstrip the ability of the farmers to supply Titanium, meaning it's going to get pricey, like arm and a leg pricey, quick. My previous post is mainly focused at those lower level people. The routes, flight points & mobs are of level that is easily handled by new players in Northrend. Once I hit 80, I have found a much quicker way to complete the same dailys. The Storm Peaks area called Valkyrion is a quick central location for most of the JC daily quest. Valkyrion Aspirant "The crazy blue chicks"
Blighted Proto-Drake Found in the same camp, over by the lava. Not to far away but still close to Dalaran you can kill Stoic Mammoth for the Northrend Ivory. The fastest mobs for this quest is Hulking Abomination. It will take you longer to fly there and back then get the Scourge Curio. I haven't really found a closer spot then down in Dragon Blight killing Ice Revenant for the Elemental Armor Scrap. All of the JC daily quests could be completed in Howling Fjord, thus it is perfectly acceptable to be 68-70 level, depends on class. Credits for comprehensive list going to Trammel. Iron Dwarf Brooch drops off Iron Dwarves. By my count, I see that to obtain every recipe that is bought with these JC tokens you would need to have 510 of them. The initial quest that leads to the daily quest. Turning in 10 titanium dust for 1 JC token. If you were to go solely on titanium dust turn ins and skip the dailies, then you would need 5100 total titanium dust to obtain every recipe. You can obtain Dalaran Jewelcrafter's Tokens by completing Jewelcrafting Dailies, BUT they also added an additional source for these tokens. Through prospecting Titanium Ore, you will gain Titanium Powder, 10x Titanium Powder is the required currency to purchase a token from Tiffany Cartier in the Cartier & Co. Fine Jewelery shop (40, 35) in Dalaran. This can significantly speed up how quickly you obtain recipes purchased with Dalaran Jewelcrafter's Tokens. Damaged Necklaces are the only other way to gain more Tokens, which are expensive. They should be considered Epics. Oh shutup about Jewelcrafting getting screwed over for god's sake. This is a profession that is not only the biggest money maker in the game, but also has the best stat bonuses. Speak for yourself. If you want to spend money on useless patterns feel free. Most sensible people realise that they don't need them and don't care about them. That goes for any profession, not just jewelcrafting. The completionists like you are very much the minority, not "most people". Dragon's Eyes don't sell for very much because nobody makes the item level 200 rings or necks with them, anymore. Rubbish. They sell for 140-150g each on my server right now. Probably to people like you who would rather waste their tokens on patterns they'll never use. Leatherworkers learn their patterns in exchance for *heavy borean leather*. Guess what? They don't get leather for free, it comes from SKINNING. A bit like ores come from MINING. Even in professions like enchanting there is still a cost in purchasing the patterns - it costs whatever you could have sold those shards for instead. All professions pay for their patterns, not just you. As much as I enjoy jewelcrafting, I may be dumping this profession come Cataclysm if its patterns get screwed over once again. Please do. Take up leatherworking or blacksmithing or something. Then you can @#$%^ about how you can't make any money, but hey, at least you'll have all the patterns right? 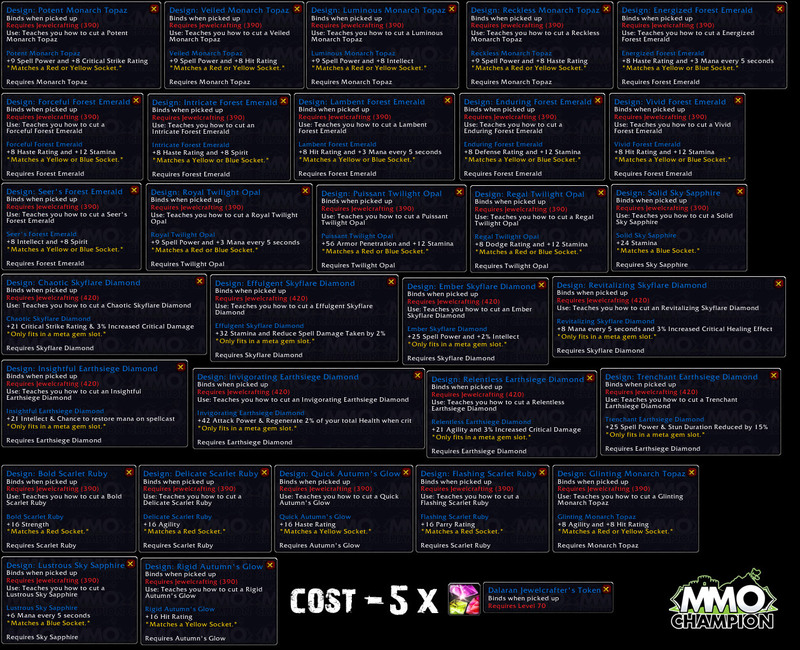 Anyone have any idea what is going to become of the JC tokens acquired in WotLK when Cataclysm goes live? Will those WotLK tokens only be good for WotLK recipes or will they carry over to Cataclysm? I am only asking because I have a sizeable stock pile of JC tokens and don't know what to do with them besides dragon's eye. The answer is that all the jewelcrafting tokens are ** DALARAN ** Jewelcrafting tokens, and will only be able to purchase the recipes they currently have in Dalaran. If your a perfectionist, spend you tokens to get every recipe, if not...Buy Dragon's Eyes and sell them before they are worthless. Is it possible for my level 64 warrior to do the JC dailies for the tokens? I am still able to get the Dalaran dailies and cash the Dalaran Jewelcrafter Tokens in for recipes and dragon's eyes. I just made myself a Bold Dragon's Eye. Either the Dalaran tokens were added back to the game somewhere along the lines, or I found some way to teleport into the past. Either way, I'm earning these, even though wowhead says I shouldn't be able to. As of this patch, these tokens are still available. My jewelcrafter just did a daily today and recieved one of these tokens. "Redeem at Cartier & Co. Fine Jewelry shop in Dalaran."